Side is one of the highly rated and most popular holiday and vacation destinations worldwide. Side is also the first choice with its 5 stars luxurious hotel by newly wedded couples for their honeymoon. It is well known by everybody that various unique and matchless historical sites in Side must be seen and explored by history lovers and explorers. well, where should you start after deciding to spend your valuable vacation? Firstly you are supposed to choose the hotel you will stay in, generally 5 stars hotel are far away from the city center .after you make your final decision about the hotel you are planning to stay you may come across that very same hotel in different travel agencies with different opportunities. The closest airport, to Side, is Antalya city airport .the distance between Antalya airport and side is 80 km .You can purchase private passenger or shared transportation in advance to make your vacation start with comfort through Antalya Havalimanı, Side Transfer. Besides that you can also reach to the highway cross section of side by some airline company s free of charge transportation ,however the closest hotel which includes the hotel you cant wait to check in will be highly possibly 20 km further than side main cross section that you will be dropped by ,therefore I would not suggest you to take advantage of free of charge transferring which could end you up in frustrations . There are buses from Antalya main domestic bus terminus to side each hour every day .it hurts me to say however again but the distance between airport and bus terminus is around 10 km. My best suggestion in this kind of situation in Side Antalya would be to reserve a private transportation with specific transfer companies. You can create your reservations with Bizim transfer online or via phone calls. There are many historical artifacts that belonging to Byzantium and roman empire in Side which has been one of the most important enclaves of Pamphylia throughout history. Furthermore, while you are browsing the paths which lead to the water side, you might find your self with such historical artifacts surrounding you in an outdoor museum that might remind the ancient times. 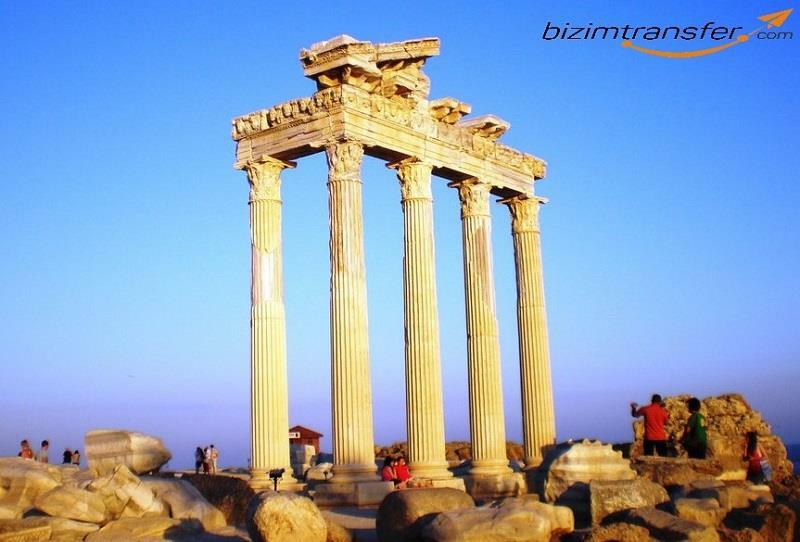 Among all these beauties Side Antique Theater comes first to dazzle you .Apollon temple with its unique out of this world architectures will bedazzle you without doubts. I would love to remind you to take pictures in front of the temple of Apollo at the sunset, one of my favorites. The Eurymedon Bridge was a late roman bridge over the river eurymedon (modern Koprucay ), near Aspendos which The exact date of the bridge's construction is uncertain. The date of construction is closely connected with the Aqueduct of Aspendos, parts of which were re-used in the bridge. In the outer shell of the bridge alone, 250 pipe-shaped stones from the aqueduct's main pressure conduit were re-used. Since the aqueduct has been known to have functioned until into the 4th century AD, that provides a terminus post quem for the construction of the Eurymedon bridge, although it is still possible that an earlier bridge already existed on this location ,let us not forget the pictures to be taken on it. There is no need to tell about Manavgat waterfall we all know how amazing and wonderful it is but I cant help my self mentioning its beauty with some actual words. beside all these other activities you can and must do in side and surroundings are included , rafting , horse safari, yacht tours. Now it is already time to end the vacation which has been fulfilled by most memorable moments and and i am sure you are looking at the all pictures by deleting some and keeping the rest in your previously arranged passage transportation vehicle I wish you the best while you are heading back to your home thank you for choosing turkey Antalya and surroundings . Please click the link below (https://www.bizimtransfer.com) to reserve and book in one of our luxurious private or shared ride from your hotel to airport .